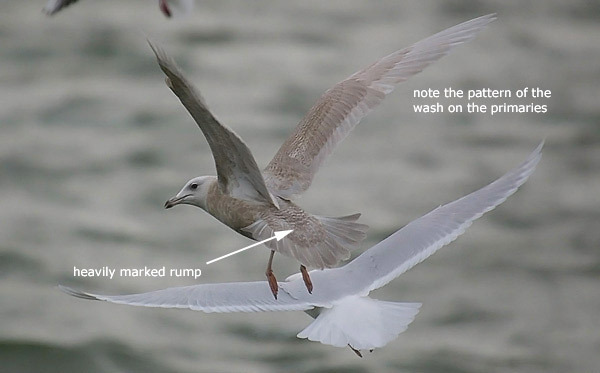 'Identification challenges presented by 2nd winter Kumlien's Gull' by Derek Charles. In my experience 2nd winter Kumlien's Gulls (Larus glaucoides kumlieni, Brewster 1883) is the rarest age group to be encountered in Ireland. I don't have all the answers to identifying them but I hope this note will at least stimulate debate among birders. Typical 2nd winter Kumlien's Gulls are usually identified without too much difficulty but there is a gap in our knowledge regarding the degree of variability among some 2nd winter Iceland Gulls (Larus glaucoides) which appear to exhibit varying amounts of wash on their primaries. 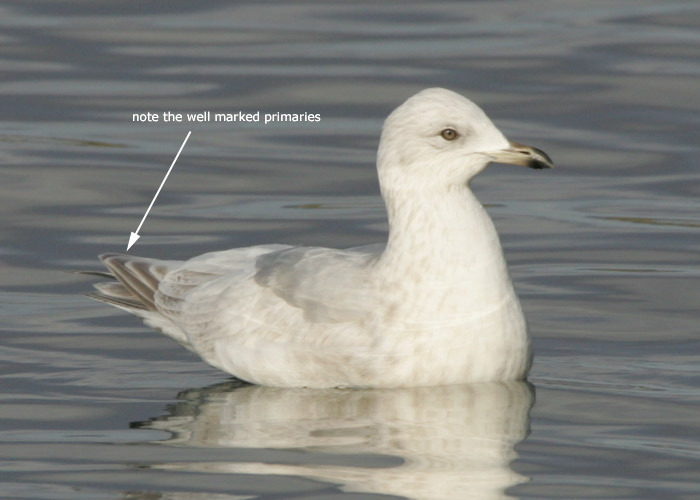 This problem is not helped by the lack of relevant information coming from the core wintering range of Iceland Gull and until this improves the identification of some birds will be at best problematical. As with Kumlien's Gulls of all ages the primary pattern is the key to identification of 2nd winter birds. The outer primaries (normally p6 - p10) have a grey/brown wash centered along the outer web of each feather normally heaviest in the centre of the feather and bleeding onto the inner web at the tip. The outer primaries contrast with paler inner primaries. Additional helpful features to look for is a solid grey/brown tail band which is usually present and some individuals show dark eyes. Other subjective features for Kumlien's are slightly larger and heavier bills and shorter primary projections but I don't find these features particularily useful when identifying individuals as there is much overlap between Kumlien's and Iceland Gulls. To begin, some examples of classic 2nd winter birds. Click on the image for more details. Typical bird 1. Rossaveal, Co. Galway, 31st March (Photo: Michael Davis). 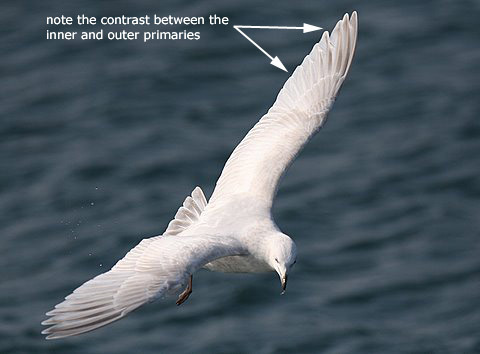 This bird displays classic Kumlien's Gull primary pattern of a grey wash on the outer primaries of p7 - p10 contrasting with paler inner primaries. Typical bird 2. Rossaveal, Co. Galway, 17th February (Photo: Gary Bellingham). Typical bird 3. Greencastle, Co. Donegal, 2nd February (Photo: Derek Charles). These examples were all observed in Ireland during the winter of 2007 - 2008. Identification of these examples is not so straightforward. All of these birds may be Kumlien’s Gulls however it is also possible they are well marked Iceland Gulls or perhaps they originate from a Kumlien's / Iceland Gull contact zone and as a result are hybrids. Click on the image for more details. Rossaveal, Co. Galway, 10th October (Photo: Michael Davis). 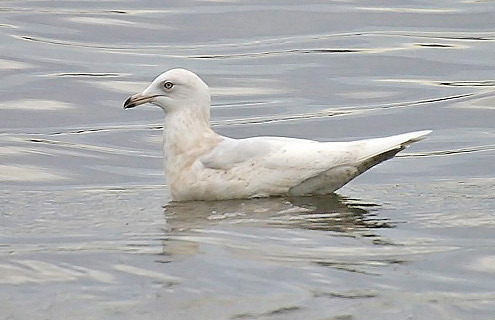 This bird was found in October which is a very early date for Kumlien’s Gull in Ireland. At first glance it appeared to show features consistent with Kumlien's Gull but as the winter progressed this changed. Greencastle, Co. Donegal, 16th February (Photo: Derek Charles). An extremely dark individual. 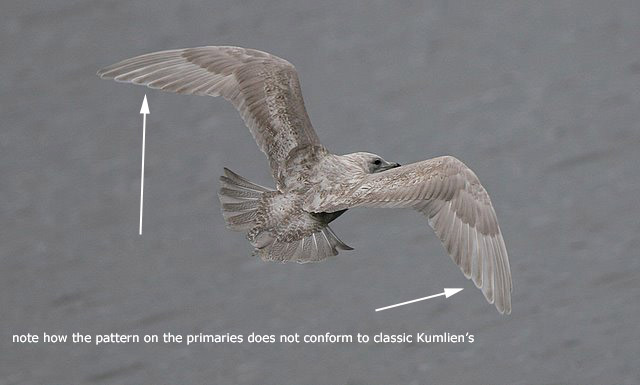 Despite showing a distinct wash on the primaries it does not display classic Kumlien's Gull primary pattern. This bird is probably best left unidentified. Waterside, Co. Galway, 2nd March (Photo: Michael Davis). This bird probably has slightly better credentials that the previous two especially as it appears to have a ghost mirror on P10 however there are other features not so easily reconciled. Compare these 2nd winter Iceland Gulls alongside classic 2nd winter Kumlien's. Click on the image for more details. Killybegs, Co. Donegal, 27th January (Photo: Derek Charles). A typical example of 2nd winter Iceland Gull, also shown side by side with a Kumlien's Gull for comparrison. Galway, 2nd January (Photo: Derek Charles). Another typical example again also shown side by side with a Kumlien's Gull for comparrison. Baxter, P. & Gibbins, C. 2007. 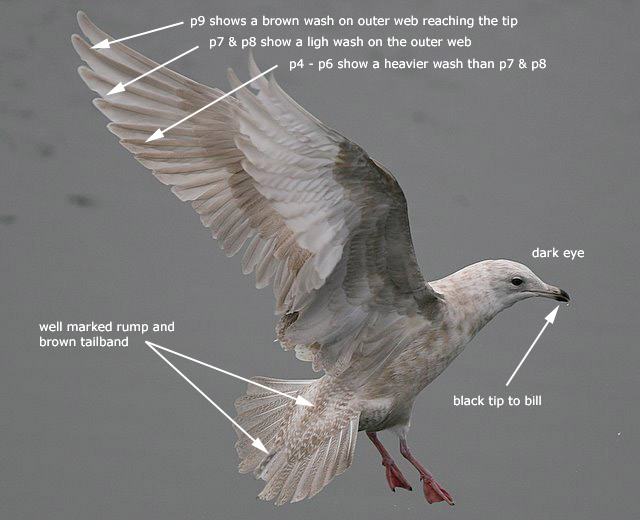 Identification of Kumlien's and American Herring Gull and other large gulls at St. John's, Newfoundland. Birding World 20(4): 162-175. Boertmann, D. 2001. Letters (The Iceland Gull complex in Greenland). British Birds 94(11): 547. Bradshaw, C. 1999. Rarities Committee Announcements ('Kumlien's Gull'). British Birds 92(2): 113-114. Charles, D. 2009. 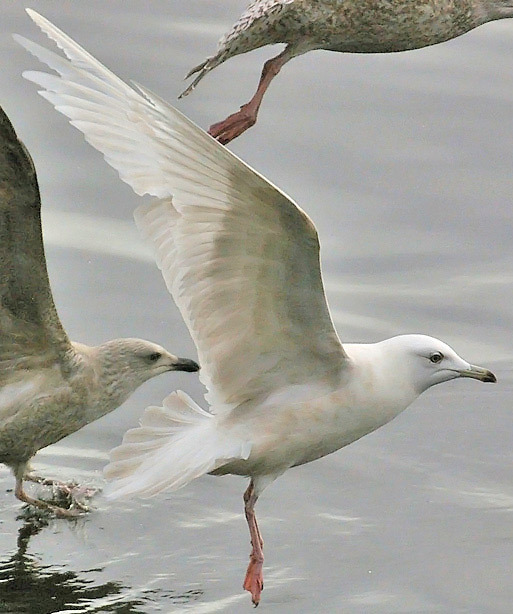 Kumlien's Gulls in Ireland and the 'Cliften Gull' conundrum. Birding World 22(3): 107-110. Garner, M. & Mactavish, B. 2001. The In-between Gull. Birdwatch 103: 26-31. Garner, M., Kolbeinsson, Y. & Mactavish, B. 2000. 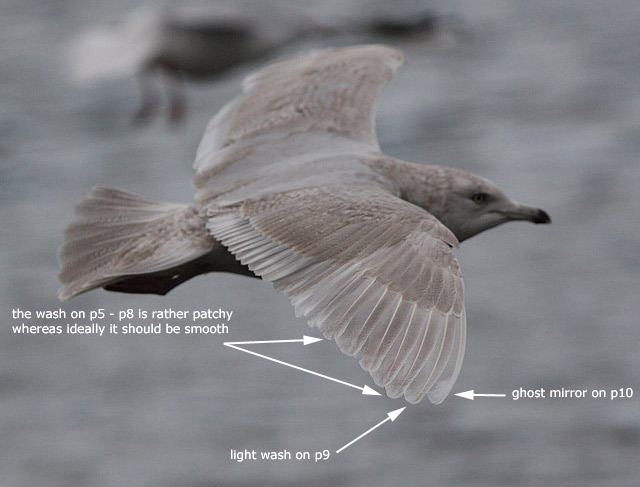 Identification of first-winter Kumlien's Gull and the 'Whitby Gull'. Birding World 13(3): 116-119. Howell, S.N.G. & Elliott, M.T. 2001. 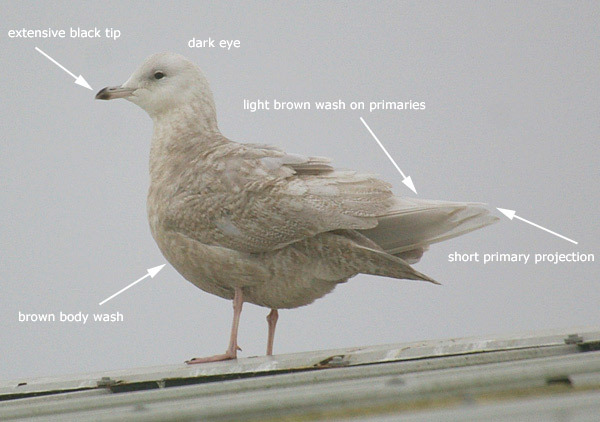 Identification and Variation of Winter Adult Thayer's Gulls with Comments on Taxonomy. Alula 7(4): 130-144. Howell, S.N.G. & Mactavish, B. 2003. Identification and Variation of Winter Adult Kumlien's Gulls. Alula 9(1): 2-15. McGowan, R.Y. & Kitchener, A.C. 2001. 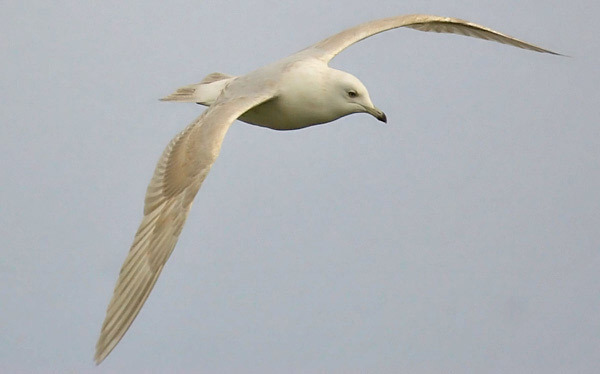 Historical and taxonomic review of the Iceland Gull Larus glaucoides complex. British Birds 94(4): 191-195. Millington, R. 1993. 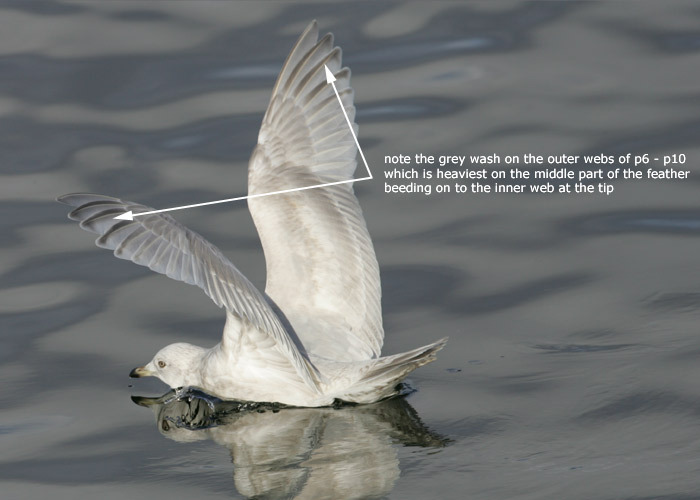 Identification and status of Kumlien's Gull. Birding World 6(3): 101-106. Millington, R. 2005. Kumlien's Gulls and hybrid Glaucous x Herring Gulls: a winter update. Birding World 18(2): 61-65. Prys-Jones, R. 2000. Letters (Provenance of the first record of 'Kumlien's Gull'). British Birds 93(6): 278. Weir, D.N., Kitchener, A.C. & McGowan, R.Y. 2000. 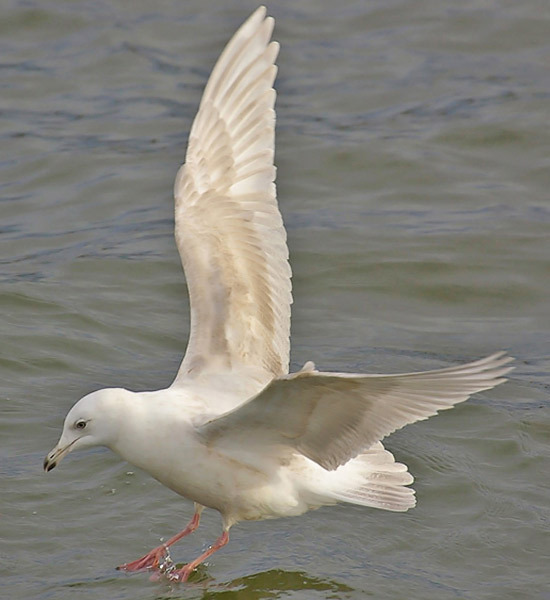 Hybridization and changes in the distribution of Iceland gulls (Larus glaucoides/kumlieni/thayeri). The Journal of Zoology (London) 252(4): 517-530.
Zimmer, K.J. 1991. Plumage Variation in Kumlien's Iceland Gull. Birding XXIII(5): 254-269. 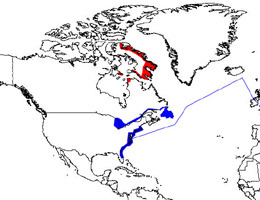 Kumlien's Gull breeds on Baffin Island and Southampton Island in the Canadian Territory of Nunavut (previously part of the Northwest Territories) and in northwest Quebec in the vicinity of Ungava Bay. Outside the breeding season it is found on the North American east coast from the Gulf of Saint Lawrence & Newfoundland south to Virginia and in the Great Lakes region as far west as Minnesota. Vagrants have wandered west to British Columbia and California; south to the Carolinas and Florida. Adult birds have been seen and photographed in Greenland during the summer and small numbers probably breed there with Iceland Gull. In winter they regularly occur in Iceland and small numers reach the Faeroe Islands. In Ireland it is a rare but regular winter visitor with most recorded in the north and west usually from December → April. In Great Britain it is a rare visitor mainly to the Northern Isles and Scotland. In the rest of Europe it is a vagrant. An influx occured during the winter of 2008/09 when birds were recorded in Belguim, France, Portugal, Spain and a few even as far south as the Azores and Madeira. Kumlien's Gull takes its name after Ludwig Kumlien (1853 - 1902), an American naturalist of Swedish decent. He described the race from a bird collected by him in the Canadian arctic in June 1878. 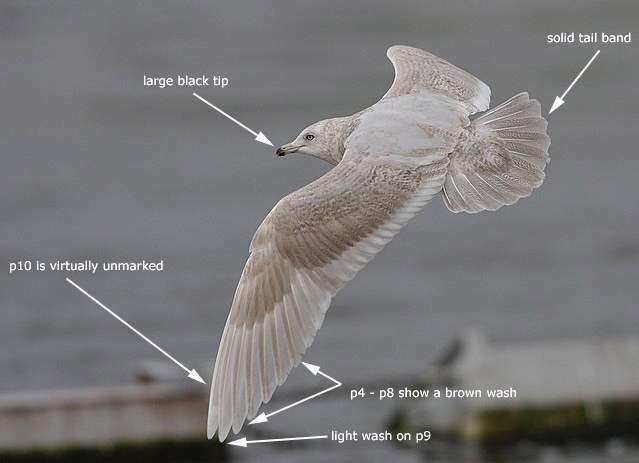 Taxinomically the position of Kumlien's Gull has been the subject of much debate but usually it has been described as a race of Iceland Gull which is also the IRBC's position.